It's not often you see a Thoroughbred running barrels in a lively and loud rodeo setting. When you do, it's even less often you find a professional rodeo rider in the saddle. 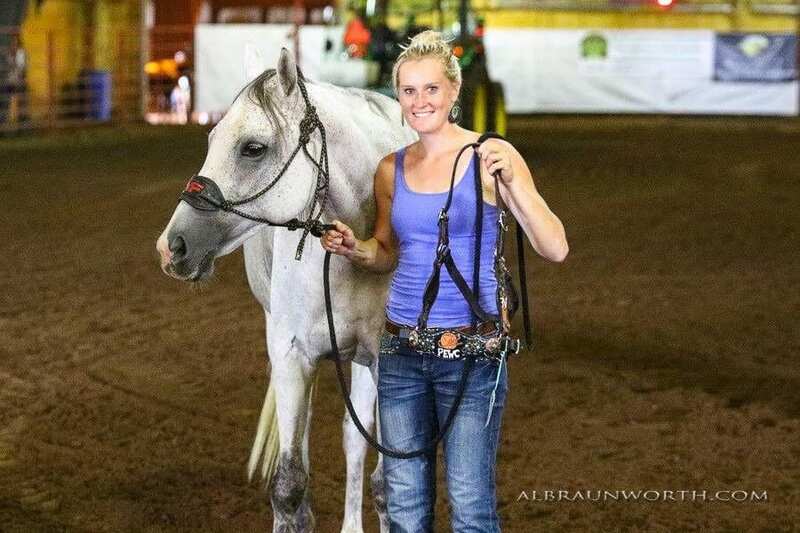 But professional barrel racer Lindsay Jensen is bucking that trend, most recently with a gray Thoroughbred mare named Arghazi, and she's picking up some major hardware along the way. Minnesota-bred Arghazi had a brief racing career of just four races – two at age two and two at age three – but picked up a win to break her maiden at first asking. Jensen acquired her a year after her last race, getting her for free after passing on purchasing her as a training and resale project. At the time Argazi was just four years old, Jensen restarted her under Western tack, taught her barrels and has been competing with her for the past seven years. Jensen earned her Women's Professional Rodeo Association card off of Arghazi, and together the pair took home the national Thoroughbred Barrel Racing Association Championship in 2014. That year they were also the top money-earners among all Thoroughbred barrel racers in the country. But just as Arghazi hasn't always been a barrel horse, Jensen wasn't always a Western rider. Before navigating barrel patterns, she was a hunter/jumper rider through and through. Jensen showed hunter/jumpers until she was 17. Then, she met a boy. “At the time I was dating a cowboy, and sure enough, I traded my helmet for a cowboy hat,” she joked. Jensen attended college at Northwestern Oklahoma State University and competed on the school's rodeo team. It was while in school that she came to the conclusion she wanted to train horses for a living. After college she went out on her own as a trainer and has never looked back. She owns and operates Rush Meadow Farms, a full service lesson and training facility located in Detroit Lakes, Minn. While her specialty isn't Thoroughbred ex-racehorses, she has found much success with the breed. Jensen usually has about eight horses in training for clients each month. 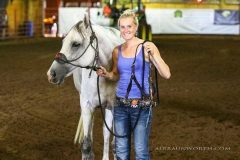 While the majority of Jensen's training clients and competition mounts are Quarter Horses, she says there aren't many differences between how she trains Thoroughbreds to compete versus other breeds. The biggest difference Jensen finds between training ex-racehorses and other horses is a tendency for former racehorses to be stiff through their necks and supple, so her first order of business when transitioning a Thoroughbred from racing to rodeo sports is to work on collecting and softening them. Jensen says she rides her horses with soft, quiet hands and that she finds off-track Thoroughbreds do very well with that type of contact. Jensen says she finds Thoroughbreds to be light on their feet and able to handle a variety of different arena surfaces. While surprising to some, she also thinks they handle the distractions of the rodeo scene quite well. This entry was posted in Aftercare Spotlight, Horse Care and tagged Aftercare Spotlight, barrel racing, Horse Racing, Jen Roytz, rodeo, thoroughbred racing, thoroughbred retirement by Jen Roytz. Bookmark the permalink.